It only makes sense that the parts and accessories you need for your GM can be found at wholesale right here in the Motor City. You can pick up your GM parts in Detroit at our warehouse. You can still get the same wholesale discount on genuine GM parts and pick up your parts for NO shipping cost! Our warehouse is located just outside Detroit in the city of Ferndale Michigan at 601 E. Marshall St. Make sure you put in the order comments “Pick at Warehouse” and we will call you when your order is ready to be picked up. GM Parts in Detroit for wholsale prices at GM-Car-Parts.com. When can you pick up your GM parts in Detroit, most orders are ready by the next business day from when the are processed. Some parts are not in stock at our warehouse and could take 5 – 10 days to come in from GM. All of our parts are genuine GM Parts. 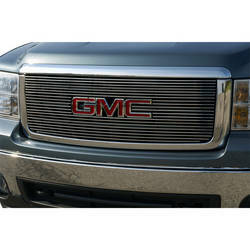 Make your 2009-2011 GMC Sierra stand out by buying a new Chrome Surround w/ Chrome Mesh grille. This new Chrome grille features a stunning oval chrome pattern and a chrome surround. GMC-Car-Parts.com offers wholesale prices online for all your GM vehicles. From the Sierra to the Chevy Van, find all the parts you need here at GM-Car-Parts.com. Include your VIN when placing your order and our staff will double check your order to ensure the parts you order are the ones you need. Orders over $300 may qualify for free shipping*. Need your GM-Car-Parts Professionally Installed? If you are in the Metro Detroit Area then just ask for your parts to waiting for you at our GM Service Center at Fresard Buick GMC. Save money on your GM Parts with GM-Car-Parts.com and have them installed by GM Certified Technicians. It’s the best deal you can get on GM Parts and Service. Just write in the order comments deliver to Service and leave the rest to us.